Before I get started I want to thank Jim (Codfish) for loaning me this latest razor created by Muhle. 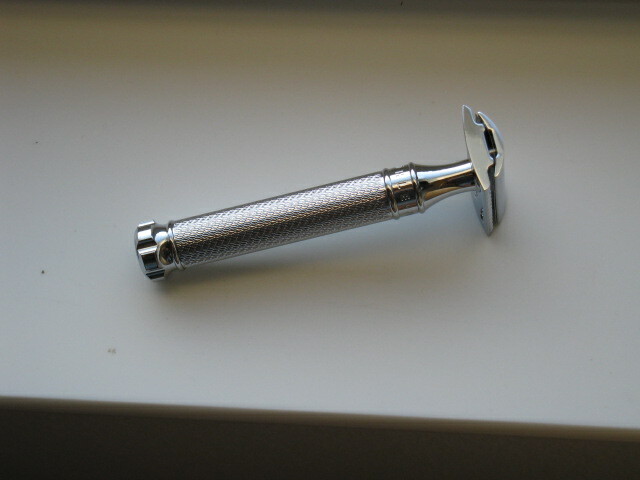 This morning was my very first shave using this precision shaving tool. First off some stats. This razor has the same quality finish as all the other Muhle products so there was no surprises. The Twist weighs in at a hefty 85 grams (3 oz) and is 4" long vs standard Muhle R89/R41 which is about 3.3" long. The handle is fatter because it has to accommodate the spindle rod that attaches to the top plate when screwing down the head. Prep none except rinse my face/neck with hot water. Lather up and begin to shave. The shave is smooth as silk considering I am using a Feather blade but it doses its job on the first pass(almost). This was mostly WTG. Second pass was ATG/XTG. Excellent, finishes the job with zero irritation. Of course we will see how long this BBS lasts which is the acid test. Normally my Joris or R41(2013') lasts almost 24 hours but I am thinking maybe 12-18 hours with the Twist. Tomorrow will be day 2 and I am expecting similar results. There is no learning curve using this razor but maybe its me since I have been shaving along time. Awesome! Did you compare the same setup with a EJ DE89? If you have, do you mind telling us if there's a difference? (04-10-2014, 04:55 AM)Balj86 Wrote: Awesome! Did you compare the same setup with a EJ DE89? If you have, do you mind telling us if there's a difference? A slightly better shave with the Twist maybe because of the longer handle and heavier weight. Also it helps to use a Feather blade. The shave with the Twist is smooth as silk and for those who have sensitive skin this razor should be a consideration. Thanks for you observations, Jerry. I'm glad you enjoyed the razor. However, wouldn't a more appropriate comparison for the R89 Twist be the current R89 Grande rather than the standard R89? The Grande is the same 4" length as the Twist and weighs 80 grams (compared to the standard R89 at 65 grams and Twist at 85 grams). Muhle makes a solid and attractive razor and the R89 head is already a proven and well-liked design. Nevertheless, I still find the Twist uninspired. The Twist basically copies an old design element from Merkur in an age when manufacturers are experimenting with new materials and aesthetics, and when the market is ready for a TTO, adjustable or even stainless steel model (or a moderately aggressive head between the R89 and R41) from a quality manufacturer like Muhle. Ironically, Muhle's DLC-coated limited edition Jet, released just a few months ago, was far more innovative and different than the Twist. The Twist appears to be a minor derivative of a current design and will offer another choice to wet shavers looking to purchase a Muhle, particularly new wet shavers. I do not see the allure of the model to experienced shavers who likely already own a R89 or EJ DE89, no less at a higher price point than the R89 Grande. On a more personal note, I do not like two piece razors because they do not break-down flat for travel and you cannot exchange handles to suit your taste, a common practice among veteran shavers. Excellent review, Jerry. You were able to provide a nice "first impressions" overview. I find it helpful that you provided the level of detail that you did. I was able to relate to the blade you uses, the soap and your technique. Your descriptions were detailed and your observations coincided with my own. I'm looking forward to following your experiences as well as your overall opinions. Looking at the knob on the Twist is such a tease . . .
You know a reputable and responsive company like Muhle could produce a great TTO or adjustable. That knob is just begging to open some butterfly doors or change the blade exposure! I want my Muhle R89 Twist To Open and Adjust! (04-10-2014, 10:46 AM)branford Wrote: Looking at the knob on the Twist is such a tease . . .
Maybe so but this is better as there is less mechanical failure. Think of this razor as in-between a 3 piece and TTO without the fuss. (04-10-2014, 07:19 AM)branford Wrote: ...in an age when manufacturers are experimenting with new materials and aesthetics, and when the market is ready for a TTO, adjustable or even stainless steel model (or a moderately aggressive head between the R89 and R41) from a quality manufacturer like Muhle. Ironically, Muhle's DLC-coated limited edition Jet, released just a few months ago, was far more innovative and different than the Twist. I have to agree. Muhle set the bar for itself pretty high. The R41 and Silvertip Fibre brushes (in all their variations) along with the DLC-coated limited edition Jet, created interest and excitement. Even the controversies over product model names kept the "buzz" alive, and people talking about Muhle with interest and excitement. (04-10-2014, 07:19 AM)branford Wrote: The Twist appears to be a minor derivative of a current design and will offer another choice to wet shavers looking to purchase a Muhle, particularly new wet shavers. I think that as attractive as it might be, not many shavers will feel compelled to own both. (04-10-2014, 07:19 AM)branford Wrote: because they do not break-down flat for travel and you cannot exchange handles to suit your taste, a common practice among veteran shavers. The inability to swap handles, in my opinion, is likely to be the biggest deal-breaker for most shavers. (04-10-2014, 11:01 AM)Codfish Wrote: I have to agree. Muhle set the bar for itself pretty high. The R41 and Silvertip Fibre brushes (in all their variations) along with the DLC-coated limited edition Jet, created interest and excitement. Even the controversies over product model names kept the "buzz" alive, and people talking about Muhle with interest and excitement. The recent advertising for the TWIST--showing the handle only--fired up imaginations and speculations about what the razor might be. When Muhle raise expectations so high, it ran the risk of a backlash from shavers who were disappointed. The "law of unintended consequences" can be a brutal one! I think "backlash" might be too strong a word. There is nothing really wrong with the Twist, it's just not that original or innovative. It's certainly a viable choice of razor for someone looking for a R89/DE89 head and the quality is likely better than the conceptually similar Merkur 34C or or 38C. I would say that I'm "mildly disappointed." Muhle is a great company with a large market share that has a history of innovation. I know that they are capable of so much more, particularly with the increased competition from artisan razor manufacturers like Weber and Ikon Shave Craft. Day two was a repeat of an excellent BBS I had yesterday the only difference was I used a different soap which is tallow based and produced in the USA. The Twist and Feather blade were made for each other as the combination produced yet another smooth and irritation free shave. Although I prefer a more aggressive razor this baby is doing just fine. I love the thick handle and I am sure most guys will like it as well. I think a pass around will be in order so more people can experience this wonderfully built razor. (04-11-2014, 04:15 AM)slantman Wrote: I think a pass around will be in order so more people can experience this wonderfully built razor. First, I had the same experience with blades. I found that sharp, smooth blades worked best. My personal favorites are Russian Perma-Sharps. They're a little hard to find, but I buy then in bulk and use them in all my razors. Tests of them show that they are second only to Feathers in sharpness. Feathers have never worked well for me. Mark H (Mantic59) had a different experience. He found that mid-grade blades worked best: "I seemed to have the best luck with “average” blades like Astra’s and 7 o’ clock’s. Higher efficiency blades like Personna “med prep” blades and Polsilver Iridium blades worked well as along as I was a little more mindful of what I was doing. Feather blades were a bit “too much” for me with this razor...". I like the idea of a pass around. If you'll help me organize it, we could start the sign up process this weekend, and ship the razor to the next tester by mid-week. NOTE: There will be a new thread for sign-up purposes only. Jerry's (slantman) thread right here here will be used for member impressions of the TWIST. Instructions will be posted in the sign-up thread on April 13. Thank you for sharing Jerry. It looks like a great razor! What a great setup using MWF which makes shaving a lot easier. A wonderful BBS easy shave without hardly trying. One of the great attributes of this razor is the thick long handle. The Feather is really doing its job. Feather and Twist NICE. This will conclude my evaluation of the new Muhle Twist. This is a very consistent and good shaving tool and Muhle has done an excellent job creating this masterpiece. Although some will say Muhle should have made an adjustable or TTO I say why when this new razor works just fine. Anybody who buys one I have confidence will not be disappointed. The final shave was smooth as silk and very close without a single trace of irritation. I would imagine Muhle coming out with an R41 version and even in Rosegold. We will just have to wait and see. Jerry, great to hear you enjoyed this razor!